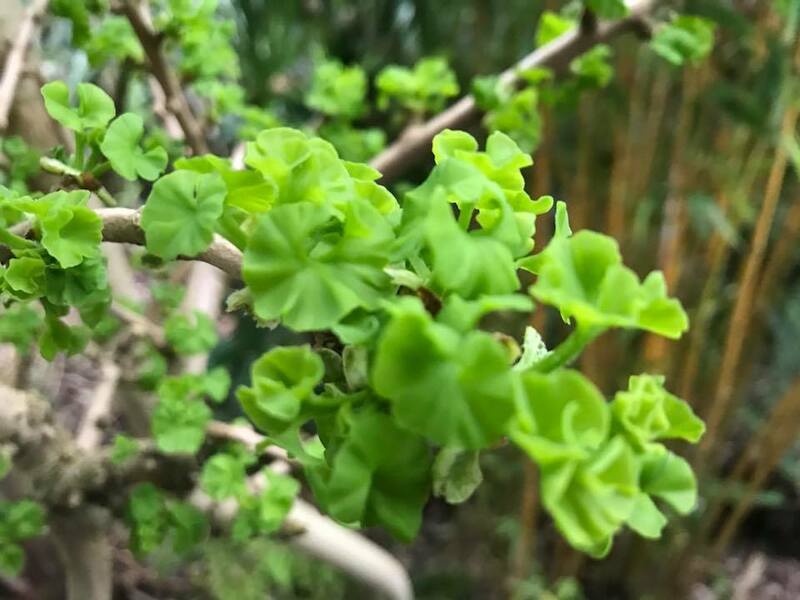 Alternative Eden Exotic Garden: Is it Safe to Say Spring is Here? 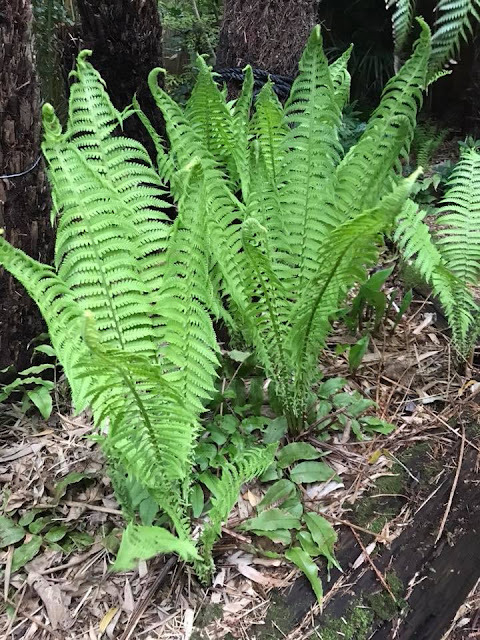 This time of the year everything is bursting back into life. Its been another slow year for Spring to arrive, looking back into the archives we have complained about late springs before, so maybe its not really late and we are just impatient! Now we are a few weeks past the clocks going forward the evenings are also light and bright, and we can actually spend some time in the garden after work. Although usually tempted to find a job to do it is an enjoyable way to just wind down after three quarters of an hour on the train. 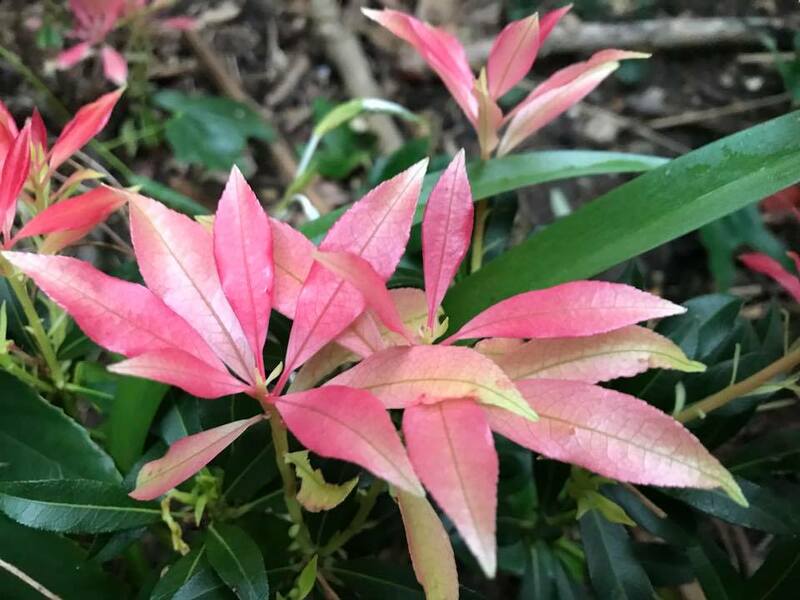 The bright pink flush on this Pieris appears on a few other plants and to the casual observer looks like flowers. 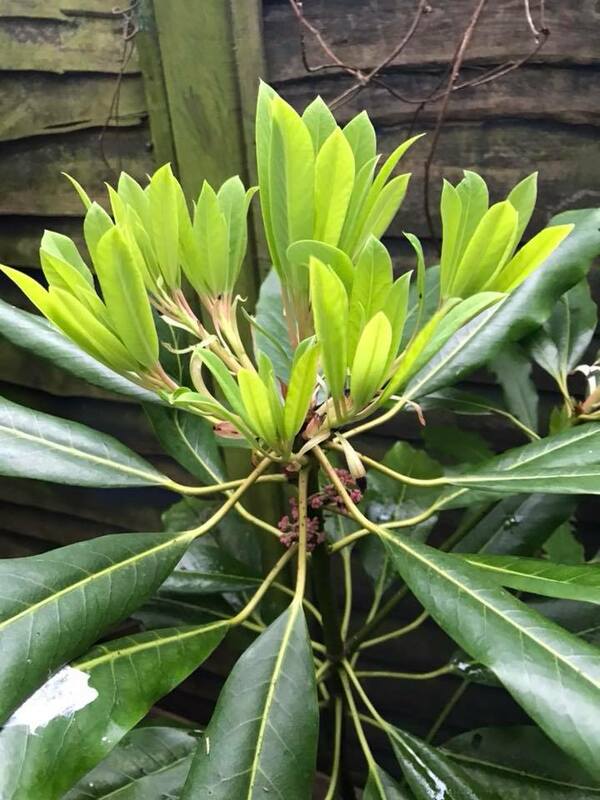 Almost like the flowers on this potted Rhododendron, (potted to give it the soil conditions it likes, our garden is just a little too alkaline for rhododendrons to do well). 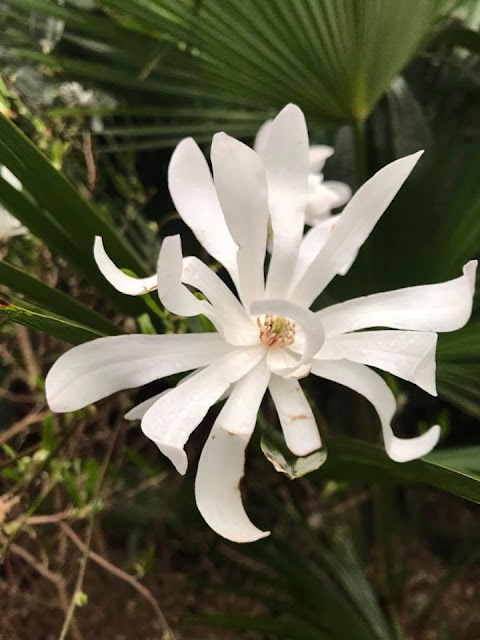 We don't really garden for flowers, but this Magnolia stellate has a wonderfully simple and intriguing flower, and in my mind fits in well to the garden as well as giving some interest in April. 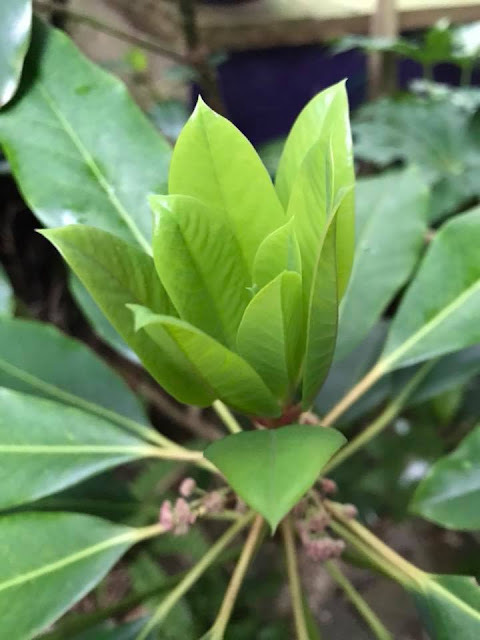 Daphniphyllum macropodum, like many other shrubs in the garden has that fantastic new green associated with spring and new growth. These two plants have been in the garden a number of years and have been a little slow in getting established. The plant in the second photo is in the rain shadow of the large sycamore (Acer pseudoplatanus) so probably doesn't get as much water in summer months as it would prefer. Another gem in the garden at the moment are the Fatsias which like other members of the family have little "hands" reaching for the sky. The Scheffleras are a little behind, but hopefully will be putting on their show in the next couple of weeks. 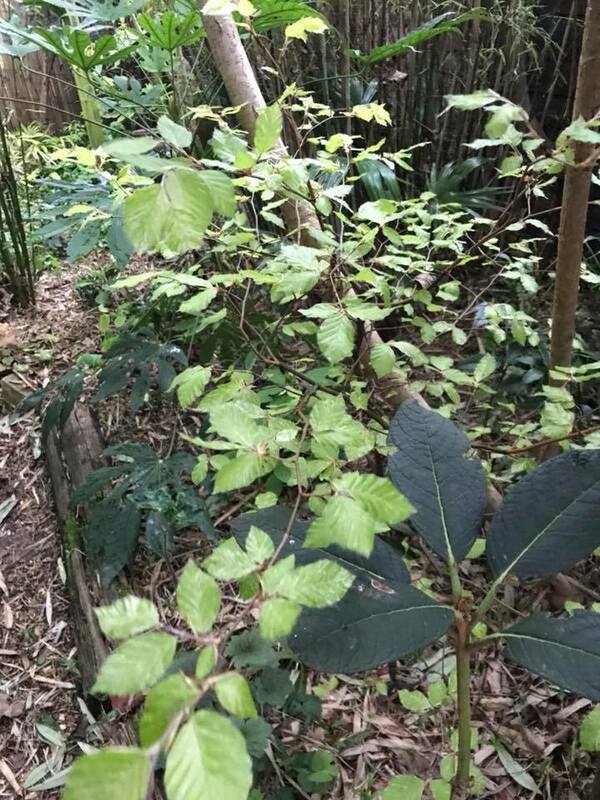 Fagus sylvatica 'Franken' is an unusual beech we have grown for many years, this was on the edge of the fire damage the garden suffered back in 2013, but thankfully came thought with only minor damage. Its fairly slow growing, and prefers dappled shade. 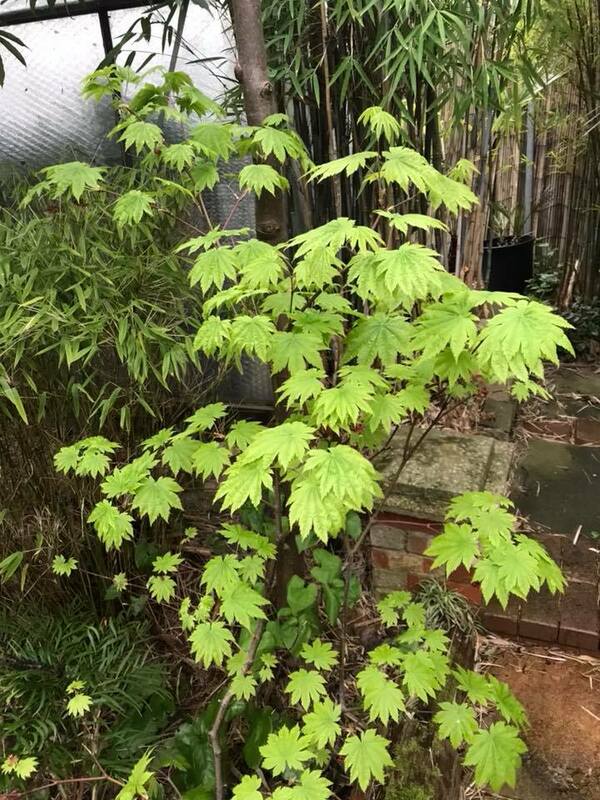 Its not the easiest of plants to track down, we got ours at Bluebell Nursery. 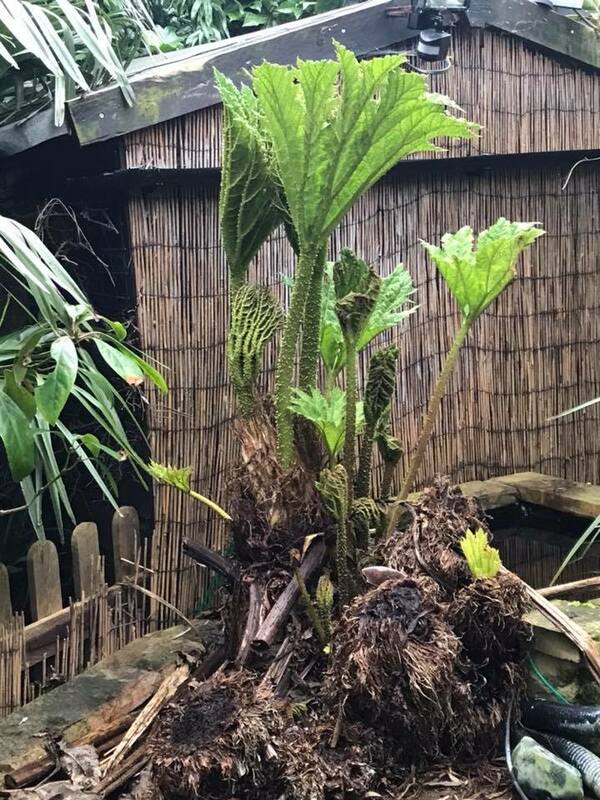 An old faithful, this Gunnera manicata has been with us for many years and has had its "potted" history documented before. It has suffered a little bit of die back this year as can be seen on the left hand side of the clump. 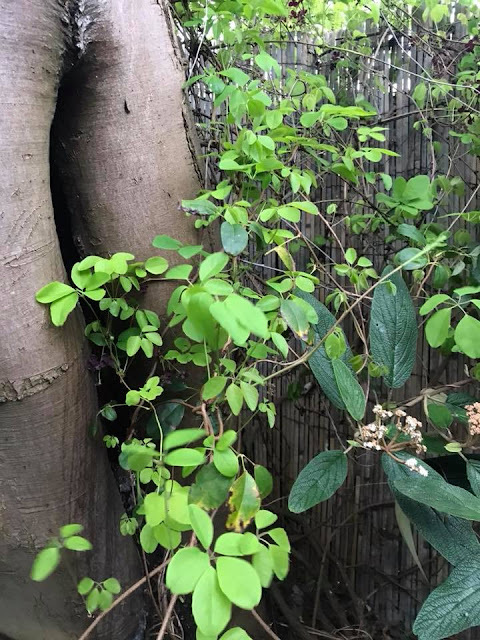 The Akebia quinata at the bottom of the garden climbs up the big Sycamore, and despite being planted close to the base of the tree has never appeared to suffer. 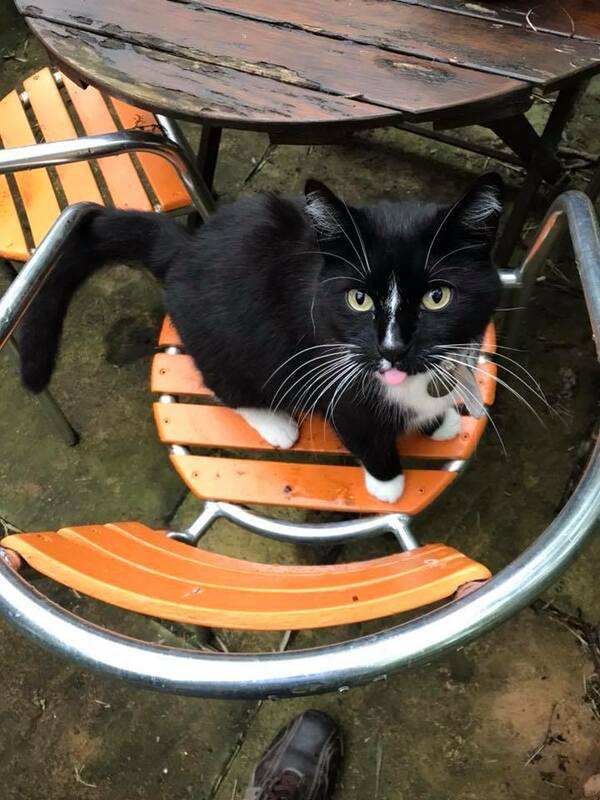 As always we are followed round the garden by one of our kitties, Knickers tends to complain that he's hungry the whole time we follows us round. This is usually despite him having just been fed. Lovely images of spring. I especially like the pink on Felis catus 'Knickers'. We're having a week of summer after a cool spring, and suddenly everything is happening at once and I'm at a loss to keep up. 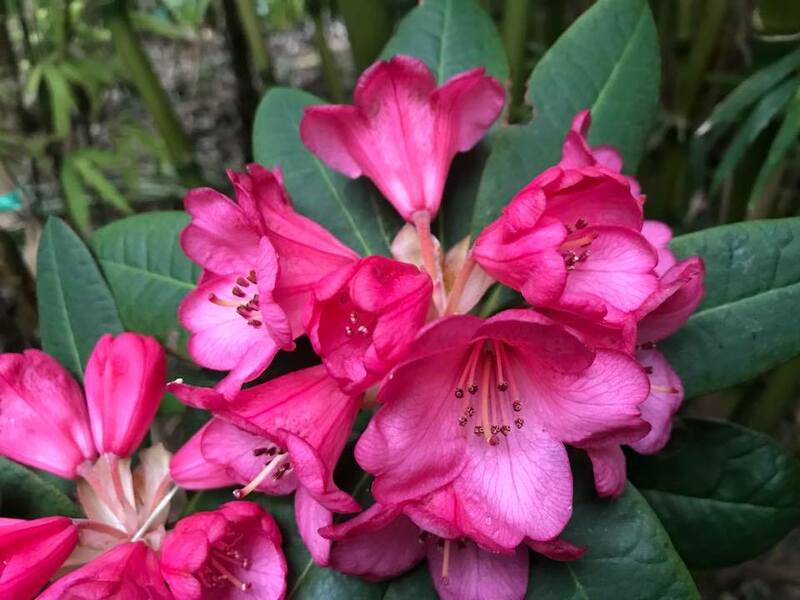 It's a wonderful time of year when the plants are coming alive and there's actually time after work to enjoy the garden. Felis catus 'Knickers' is looking especially nice this spring! 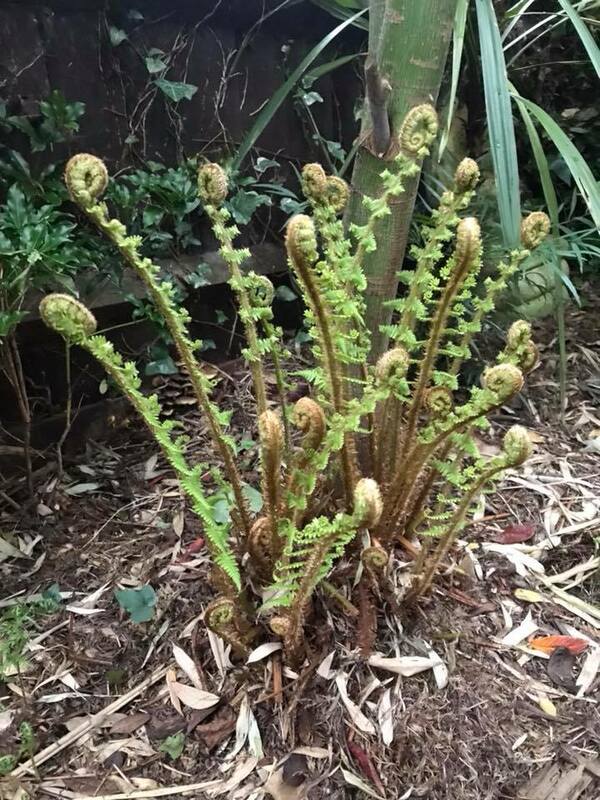 All the spring unfurlings.. I love it ! We've moved beyond that point there but I get to re-live it though the photos of friends in colder winter climates. Like Knickers, my cat Ronin is always looking for food. 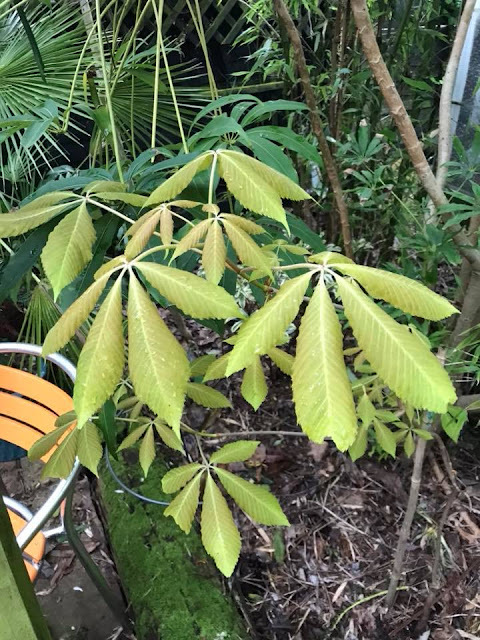 My Schefflera have been slow waking up too. 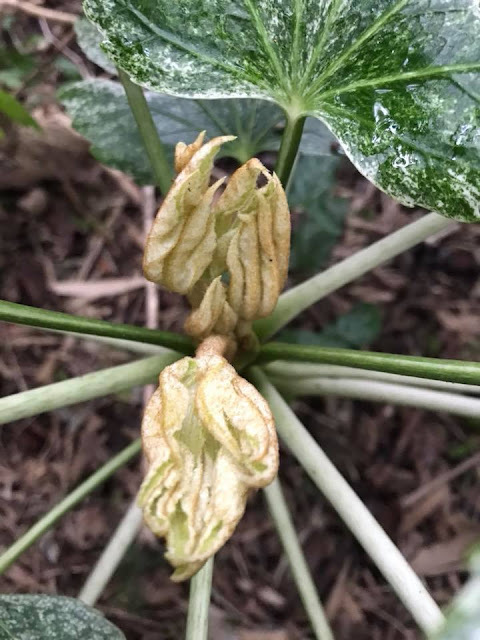 So lovely to see all the new leaves unfurling in your garden.